Think about this. A rubber warehouse and a chemical factory, located bang in the middle of a crowded residential area, are burning for more than 19 hours now. 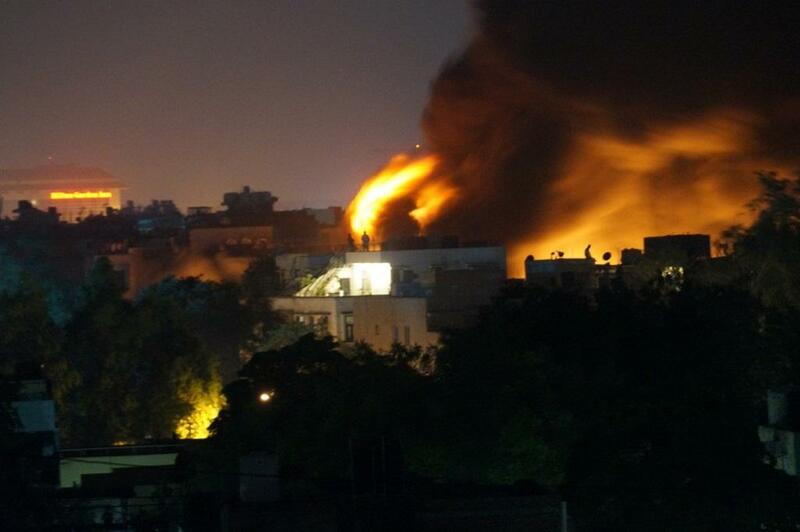 After at least 70 fire tenders failed to douse the flame, Air Force was asked to intervene. According to officers of the Delhi fire services, this fire incident in Khirki Extension, one of the enclaves in Malviya Nagar—a locality in South Delhi—was of the “highest magnitude” so far this season. So, what led to the fire? At around 4 PM on Tuesday, fire started from a truck (No PB08CX2955), which was loaded with rubber compounds. The truck was parked in front of a rubber godown at the backyard of Sant Nirankari Public School. It gradually spread to the eastern corner of the godown owned by Maxwell Pvt. Ltd, which sells raw rubber for rethreading of vehicle tyre. According to media reports, rubber stored in inflammable metallic and plastic boxes caught fire. Moderate wind also fanned the blaze. About 13 buildings, one school and a gym were evacuated for safety reasons. Even as we write, the fire department claims that it will take 2-3 hours more to extinguish the flame as all the material needs to burn out completely. The incident deifnetly affected the air quality, with initial observtaion from the nearest air quality monitoring station (Siri Fort) showing a spike in PM10 level from 403ug/m3 at 4 PM to 412ug/m3 around 8 PM on Tuesday. What does this incident mean for the residents in this part of the city, who are already bearing the brunt of poor air quality and diseases associated with it? Burning of rubber and plastics leads to highly hazardous level of CO (carbon monoxide) and HCN (hydrogen cyanide) emission—all considered asphyxiants that can cause unconsciousness or death by suffocation. Rubber and plastic burning also leads to emission of irritants such as HCL (hydrogen chloride) and SO2 (sulphur dioxide)—both capable of causing sensory irritation of the respiratory tract and Pulmonary edema, which is fluid accumulation in the tissue and air spaces of the lungs. Acrolein, which is also released when rubber is burnt, is highly toxic, and causes burns to skin and eyes. Even a low-level exposure can cause nasal and respiratory tract irritations. Given the serious threat that such fire incidents cause to human health, the Delhi administration has to answer why no action was taken against the godown owner, who had reportedly not obtained NOCs to run it? Shahdara in East Delhi has over 1,000 such illegal factories clustered in residential areas. Fire incidents and casualties are often reported from the factories located here. On April 9, four workers, including two minors, had died in a similar fire incident at a shoe-manufacturing unit located in a residential area in Sultanpuri. The factory was operating in that area without permission. Delhi High Court had then asked the government, police and Municipal Corporation to inspect the premises of the illegal factory. If the authorities had taken a leaf from the incident and cracked down heavily on those illegal units, the Malviya Nagar incident could have been averted. In May 2017, when lives of about 500 school kids were put at stake when a toxic chemical leaked in a busy slum area in south Delhi, Down To Earth had highlighted lapses on the part of urban planners who allowed such establishments to thrive in busy residential areas.